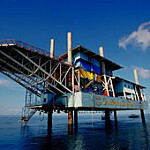 Been diving in Artificial reef? Please Vote! This manmade reef has been made by a variety of different items that have been sunk into the sand. This dive site was made by the dive resorts on the island found on the Eastern side of Mabul Island. Old dive boats, crates, wooden boxes, and other objects have been sunk to create the manmade reef that has a variety of different shapes. This has been a great success and the site is now home to an abundance of marine life. The dive site goes down to about 20 metres and so makes a good morning dive. A large school of bigeye trevally have taken up residence and they roam around the reef looking for food. Divers can also spot giant potato groupers lurking around the reef. Some of these have grown to over two metres long. The structure is also home to many frogfish that have attached themselves to the various pieces of the structure. Lionfish and scorpionfish are also common and can be seen on most parts of the reef. At the base of the reef, divers can spot pipefish and around the sandy bottom, stingrays can be seen resting. Juvenile barracuda have congregated in large schools and as have batfish; both use the structure to feed and as protection. Ribbon eels, juvenile sweetlips, nudibranchs, and scorpionfish have also all taken advantage of the site. Map of Mabul, Artificial reef dive site.